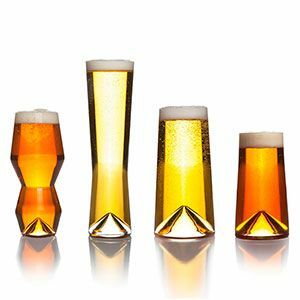 Designed by Italian glass artisan Daniele Semeraro, these unique beer glasses have a modern design and are perfect for any beer lover. The Monti-Taste Set glasses cater to the burgeoning craft beer market and holds each of your favorite bottles of beer perfectly. The Monti-Taste Set includes four (4) glasses specifically designed for IPA, Pilsner, Pint and 12-ounce brews. Your gift is securely packaged to safeguard the shipping process. If you purchase the glasses from GiftTree, engraved monogram is complimentary (same initial on all glasses) and a complimentary card with your personal message is included with your gift.